The cardboard should be about the thickness that is at the back of a writing pad. 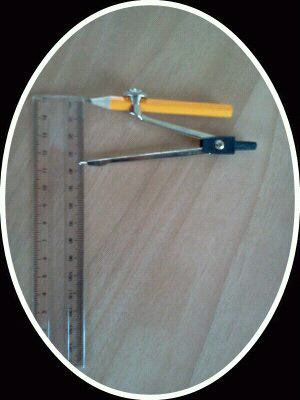 (1) Place the pencil in the pair of compasses and measure on the ruler 9/16ths inch (1.5cm). 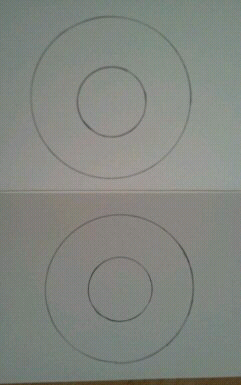 (2) Draw the circle, diameter 1.12 inches (3cm), onto the cardboard. (3) With the pair of compasses measure on the ruler 1.5inches (3.5cm). (4) Place the point of the pair of compasses in the centre of the 1.12 inches (3cm) diameter circle aleady drawn and draw an outer circle, diameter 2.75inches (7cm), onto the cardboard. 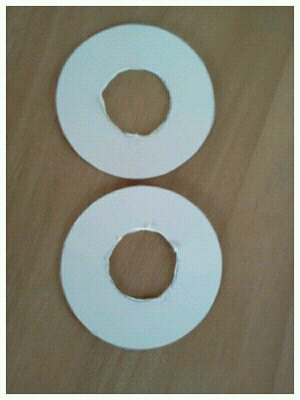 (5) Cut out the outer circle and then cut out the inner circle. 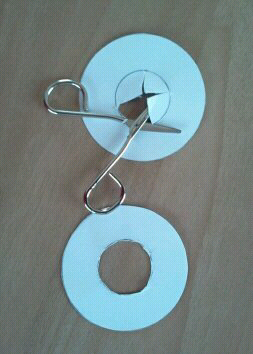 (To make it easier to cut out the small inner 1.12 inches (3cm) circle, first push a sharp point into the centre of the cardboard to make a hole, then enlarge the hole with a pair of scissors and from the centre up to the edges of the 2.75 inches (7cm), make several diagonal cuts all round so that there are little triangular pieces cut in the cardboard that can be pushed out and cut off until the entire circle is cut out of the middle). That completes the first piece. 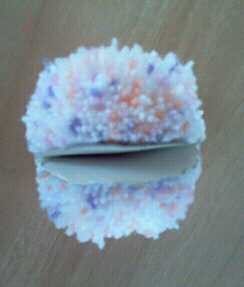 (6) Make a second piece alike. (7) Place the second piece on top of the first piece. 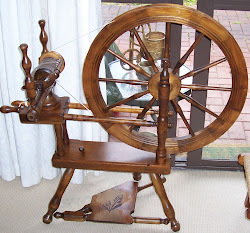 (8) Cut a long length of yarn and thread it through the small 1.12 inches (3cm) inner circles and up over the top of the larger 2.75inches (7cm) outer circles and then back through the small 1.12 inches (3cm) circles until the yarn covers the whole of the ring. Keep going round and round, cutting more yarn as required, until the hole through the small 1.12 inches (3cm) circles can't take any more yarn. 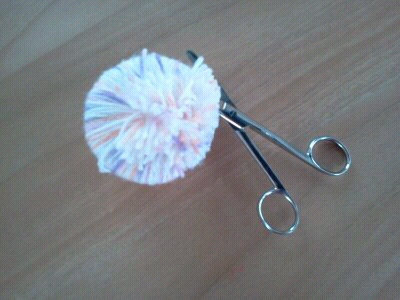 (9) Cut the yarn and secure it so that it won't come loose. 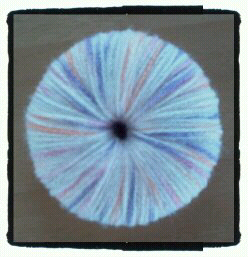 (10) Carefully cut the yarn along the top edge of the Outer 2.75inches (7cm) circle. 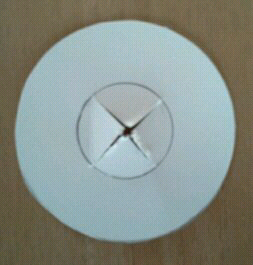 Prize the two outer circles apart but taking care not to pull them completely out. 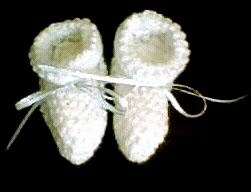 (11) Take a length of yarn and tie it round the middle of the two larger 2.75inches (7cm) circles. 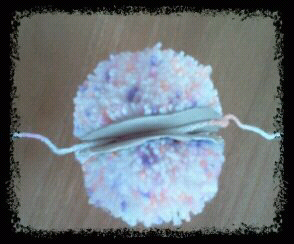 Make a slip knot and pull it up tightly thus securing the middle of the Pom Pom. 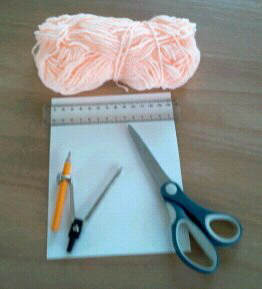 (12) When the yarn is properly secure remove the cardboard by pulling it gently off the cut ends of yarn. 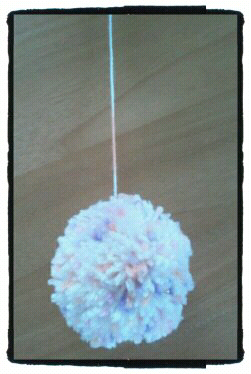 Fluff up the Pom Pom so that it is in the shape of a ball.